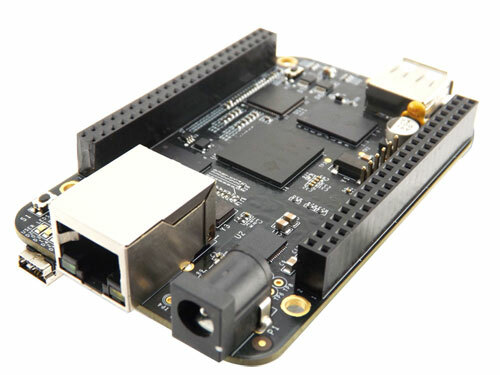 element14 BeagleBone Black(Rev C) is a development kit designed by Shenzhen Embest Technology based on an AM3358 processor which integrates an ARM Cortex-A8 core operating at up to 1GHz and has abundant peripheral devices. element14 BeagleBone Black(Rev C) provides lots of expansion interfaces such as Ethernet, USB host and OTG, TF card, serial, JTAG (no connector by default), HDMI D type, eMMC, ADC, I2C, SPI, PWM and LCD. element14 BeagleBone Black(Rev C) is designed to satisfy the different requirements of various fields including game devices, home and industrial automation, consumer medical devices, printers, intelligent tolling systems, weighing systems of intelligent vending machine, educational terminals and high-end toys. The general interfaces include 4 sets of General-Purpose Input/Output (GPIO) interfaces, each of which provides 32 dedicated GPIO pins, and therefore the total pin number of GPIO can be up to 128 (4�32). The Programmable Real-Time Unit and Industrial Communication Subsystem (PRU-ICSS) consists of dual 32-bit RISC cores (Programmable Real-Time Units, or PRUs), memories, interrupt controller, and internal peripherals that enable additional peripheral interfaces and protocols.